A long time ago, my grandmother spoke of "dormant oil" as a way she used to control insects on her fruit trees. What is that and is it still effective? Dormant oils have been around for centuries and are extremely effective in killing insect pests on plants, shrubs and trees. Back in your grandmother's day, "dormant oils" were heavy oils, weren't as highly refined as they are today and were generally limited to fruit tree applications before bud break. Today, there are a number of highly refined oils that are safe at different times of the year depending on the insect pest. Dormant oils are much safer to humans and the environment than synthetic pesticides that are on the market today. Scientists also believe that insects have not developed a resistance to oils like they have to synthetic pesticides. While oils don't work for all pests or on all plants, they are effective in a wide range of applications. These highly refined oils are generally referred to as "horticultural" oils and originate from various petroleum, vegetable and animal based sources. All of the oils are effective in the same way; they either suffocate the insects or penetrate the cells of the insects. In any case, you must be able to see the insect or the eggs and directly apply the oil to be effective. You may also need to apply it multiple times. The fact that oils are directly applied to insects to suffocate them also means that they are not harmful to humans like chemical pesticides which kill pests through disruption of metabolic processes. 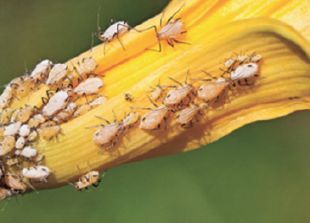 Horticultural oils kill: Powdery mildew, Aphids, Whiteflies, Mites, Scale Insects, Leafhoppers and a host of other pests. Horticultural Oils need to be applied when the temperature is above 40 degrees and no freezing is expected before bud swelling and bud break (when the plant is dormant). There are some oils that can also be used as foliar treatments in the summer, so read the labels carefully for your specific application. Horticultural oils are not a "silver bullet." Some plants are susceptible to injury from horticultural oils so be cautious and read labels carefully. Susceptible plants include: Hickories, Maples, (especially Japanese and Red Maple), Black Walnut, Smoke Tree, Redbud, Junipers, Cedars, Spruce (especially Dwarf Alberta Spruce), Plume Cedar and Douglas firs. Another caution: horticultural oils should not be used on plants that are blue in color like blue hosta or Blue Spruce since they get their color from a waxy coating that could be removed by the oil application which would turn them to green.